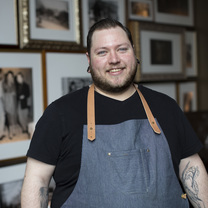 Jake Whitlock is the chef for 1300 Fillmore. He already has a rich background of cooking skills (he trained under chef Tim Archuleta of ICHI Sushi). "The Thor of the fish sticks! Perfectly fried. Snackin!"